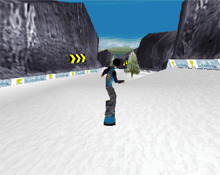 This is a very cool snowboarding game. Jump and make tricks. The better tricks you perform the more points you will get. Unfortunately, this is only a demo version. But the game is so cool that we just had to list it here.